Stuck for which first year accommodation to apply for? At Cardiff University, Talybont is one of the best places to live when you first move away from home. Of course, the university also offers lots of other accommodation (from smaller halls to student houses), however as I have more experience and knowledge of the Talybont residences, I decided to focus this post on the wide range of flats available there. Taly North is a very sociable place to be. The bedrooms and kitchens are quite small compared to some of the other Talybont accommodation, however this means that you get to know your flat mates very well and very quickly! It’s also quite common to get to know the flat opposite you and become close friends with them too. 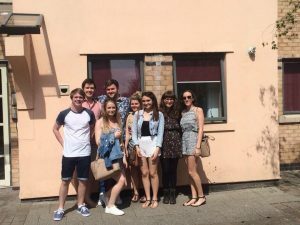 Talybont North students boast over their excellent house parties, as well as their close proximity to Talybont gym, Tesco Extra and, most importantly, Mcdonalds! The rooms here are also very affordable, with the cheapest being just over £4000 for the whole year. So, if you’re worried about your student loan not stretching very far, I would definitely recommend considering Talybont North. This is where I stayed during my first year at Cardiff University! I can’t recommend Talybont South enough. The rooms here are slightly more expensive than in North, however they are still very affordable and mean you get that little bit more space. I found that Taly South was also a very sociable place to live – there was always something going on and I met most of my closest friends here. It can get quite loud at times, particularly when it’s a Saturday night and your house is hosting a flat party, however it is always so much fun! These flats are also slightly closer to the university (which is always a bonus!). The flats range from four to eight people, however your flat is chosen randomly so you probably won’t know exactly how big yours is until you arrive. Taly Court is a little more expensive, however the flats here are a lot nicer and boast several luxuries. The one that everyone was always most envious of was the sofa in each flat. This might sound like a fairly standard item to have a moment, but trust me when I say you really do miss these in university accommodation! Taly Court is also the closest to the university out of all the Talybont residences, which means a little bit more time in bed in the morning! It’s the furthest from Tesco Extra, however, and slightly less well known for big house parties. Taly Gate is the most expensive of all the Talybont accommodation. I must admit I never actually saw inside a Talybont Gate flat, however I assume they’re extremely nice and very spacious from what the outside of the houses look like! They’re also just minutes away from Tesco Extra and McDonalds which is extremely convenient, however they are the furthest away from the university. Talybont Gate is very popular with postgraduates as it is fairly quiet – so you’re less likely to get woken up at night by loud groups of freshers! If you want more information about any of the Talybont residences, or the other accommodation that Cardiff University offers, then have a look at https://www.cardiff.ac.uk/study/accommodation/undergraduates. If you have any other questions then feel free to ask me, I’d be more than happy to help!